BACKTOFRANKBLACK.COM: Lara Means Week: Thursday - Means to an End? Today we do something a little different. When we approach writers to do work for our special weeks, we want their take on a given subject - to me, that is interesting that asking writers to simply gush in some "mean"ingless (punnn!) and dishonest dedication. Our next article is by paranormal/horror writer (The Rowan Gant Investigations) MR Sellars. We approached him to do an article about Lara Means this week and to our surprise - and excitement if I was honest - it is quite the opposite of Alison Nastasi's article on Tuesday. We hope you enjoy Murv's introspection into Lara Means and that it proves a talking point for yourselves - feel free to leave your comments, ideas or even counter-arguments in the blog comments. I - and I imagine Murv also - would be fascinated to see what you think of his points of view. So without further ado, over to MR Sellars. Be warned, this is a candid opinion piece - we hope it makes you think even if you don't necessarily agree with his analysis on Lara Means. Lara Means. I absolutely hated her. I know that sounds harsh, especially when you consider that the character was supposedly from Saint Louis, and I have lived in Saint Louis since the nineteen-cough-cough-sixties. Obviously, I should have been a cheerleader for a “home town girl” making good with the Millennium Group. But alas, I wasn’t at all. Again, harsh, but bear with me for a moment and maybe I can explain. I suppose it’s entirely possible that I was viewing her with the jaundiced eye of an author. In fact, I’d say it’s not just possible, it was an almost certainty. Unfortunately, I’ve discovered over the years that my profession has sometimes ruined other literature and entertainment for me because I can tend to be far too analytical about it. It seems that anytime I sit down to watch something, I will seize on a moment, plot, scene, character, what-have-you, and then turn it over and over in my hands, inspecting it closely and subsequently dismantling it in order to see exactly what makes it tick, and moreover, how I would have done it were I the one doing the writing. Case in point, Lara Means. I immediately saw a direction she could go that wouldn’t make me particularly happy. When first we meet Lara in the episode Monster, she is being introduced close on the heels of Frank’s separation from Catherine. Now, anyone who listens to the MGS podcast knows – and using the vernacular of today’s “Twilight Reading Tweens” – I’m a dues paying, card carrying, dyed-in-the-wool member of “Team Catherine.” At the risk of sounding overly “romantic” about the situation, the initial view I saw – as a writer – regarding Lara was that she could very easily pose a threat to Frank and Catherine’s relationship, which as we were all well aware was already on unstable ground in the first place. I mean, let’s face it – Lara is pretty, knowledgeable, and is a forensic psychiatrist. Catherine is pretty, knowledgeable, and is a therapist. See the parallels? Then, we take an estranged Frank and place him far away from home with her. While there are personality differences that keep her from being a mirror image of his wife, she is still a seriously intense reflection of Catherine on many levels. In literary parlance – or any other for that matter – this is a setup. Also, for what it’s worth – and I personally think quite a bit – Lara is in a position to understand Frank and his situation far better than Catherine has been able to accomplish to date, no matter how hard she has tried. In fact, we later find this out from Frank’s own lips in The Fourth Horseman and The Time Is Now. In the event you don’t recall these references, Frank phones Lara for personal advice in the former, and then in the latter, literally states aloud that she is the only one who has ever understood him and his situation. Granted, they started off on the wrong foot, having been purposely pitted against one another in a test designed by the Group, but that’s yet another literary device. Initial conflict will often give rise to romance, or even simply sexual tension. Not that sexual tension is ever really simple, mind you. Now, I have to admit something: As season two progressed, and the friendship between Frank and Lara grew, I became less worried that they were going to introduce a new love interest for our intrepid, roving, freelance criminal profiler. Instead, I started seeing Lara as a female construct of Frank at an earlier point in his life. By that I mean the part of Frank we had only been told about, but had never seen. As in, the period of time pre-Millennium Group when he was coming into his gift, yet fearing it all the same. If you recall, in the Pilot, Frank tells Bletcher that the Millennium Group had, “helped him understand the nature of his facility.” Lara obviously did not yet understand her own, which as it turns out is colorfully illustrated in the episode Anamnesis. Speaking of Anamnesis, this episode is one of my favorites, largely due to Catherine Black being featured prominently. However, by the same token, had the concept of Frank and Lara as an item been in the cards for those scripts, this would have presented confrontational tension between the wife and mistress. Of course, this was a non-existent thread within the episode. 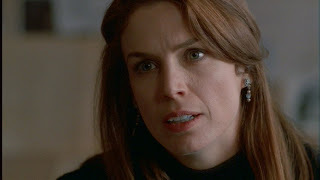 In fact, it was made perfectly clear that Catherine saw only the Group as “the other woman” – as she stated to Peter Watts in Monster – and while it was apparent that she held some amount of disdain for Lara Means, it was not jealousy. And, by the end, one could easily see that Catherine felt, in many ways, the same compassion for Lara she felt for Frank. Because of the development through the season, my hatred for Lara waned. I grew to like her – grudgingly – and at times, feel sorry for her just as Catherine did. And, later, as the season drew to a close, I was faced with a mix of emotions regarding her character, ranging from feelings of betrayal, to pure empathy. In writing this particular article I once again must make an admission – my perception of Lara still wavers to this day. I say this because when I agreed to pen this analysis, one of the first things I did was park myself in my favorite rocking chair, complete with the season two DVD’s in hand, and then proceed to watch The Beginning And The End PT2, simply because it sets the tone for the season itself. That simple fact made it a moral imperative to view it first in order that I go into this project with the proper frame of mind. After that, in rapid succession, I watched every episode that featured Lara Means, reluctantly skipping those in between. This is why my perception of the character sits on a fence. When you compress that much Lara into such a confined space, you end up seeing a fairly detailed sketch of the relationship between Frank and her, and it develops right before your eyes with nothing to distract your attention. And this brings me to the original question that was posed regarding Lara Means and this article itself. Where would I like to have seen the character go if she’d continued into season 3? And there, my friends, we have a bit of a quandary. Given my personal style and story preference, had I been writing the series I would have done exactly the same thing with Lara that was already done. However, if I had for some odd reason brought her into season three, I suspect it would have been in the form of a ghost. Not a white sheet wearing, ethereal, Casper clone, mind you, but a psychological ghost that haunted Frank as much as his memories of Catherine did – until, of course, he achieved closure in The Sound Of Snow. But then… You knew there would be a “but”, right? The “but” in this case is that in the broader analysis, I can see where Lara could have been an added obsession for Frank. He was already tightly focused on bringing down the Millennium Group, and by the same token I can imagine that he would still be seeking to rescue those he saw as friends. While his relationship with Peter Watts was no longer truly viable, his desire to rescue Lara could easily have become just as consuming as his primary obsession. And, in the hands of some writers, a deeper relationship between the two may well have formed. That’s not where I would have taken it as an author, but it is definitely a viable avenue for a dramatic work. Of course, all of this rambling on my part simply begs a different question: Do I still hate Lara Means? Besides being an avid fan of all things Millennium, M. R. Sellars is an active member of the HWA (Horror Writers Association) and author of the best selling paranormal thrillers subtitled The Rowan Gant Investigations. The series currently stands at 1 novelette and 9 novels, with the 10th to be released July 2010. He can be found at www.mrsellars.com as well as popular social networking venues on the world wide web. 16 Responses to "Lara Means Week: Thursday - Means to an End?" Another interesting viewpoint on Lara Means, and great indeed to read something that doesn't simply gush unequivocal praise. I do find myself disagreeing a little on one point, though. First of all, though, I would declare myself also a full pom-pom wielding cheerleader for "Team Catherine" and often felt we didn't get to see enough of her on-screen. I can therefore understand - and shared - the initial fears that Lara might somehow come between Frank and Catherine. But I very quickly came to understand that this was never on the cards, and I never felt there was or could be anything sexual between her and Frank. In fact, I was pleased that it never became an issue and that, as two adults of opposite sexes, Frank and Lara had a relationship that was close but never sexual; that seemed like a mature and all too uncommon scenario in television when the "obvious" choice taken would be to add a little will-they-won't-they frisson to keep the audience guessing and hence watching. As for what would have happened had we seen more of Lara Means in Season Three, this intrigues me too. I touched on this in a rambling response to Alison's article earlier in the week, and think that the notion of her as a "ghost" would have been an interesting one. I would have seen her as either damaged beyond repair from her involvement with the Group, or perhaps ultimately enlightened should she have eventually made a recovery. Either way, her character felt like it had much more mileage left to add to the drama, hence adding her to my wish list to return for the movie! @Murv, not quiet at all. The commments will start coming in. We really wanted to get another view on the Lara Means character. Your article is a great contrast to the brilliant one Alison did. Both are well thought out and make fantastic points. We thank both of you for not only taking the time to do this for Lara Means week, but doing such great work! While I found myself loving both characters. (Catherine and lara) I have to reluctantly agree with some of your points Mr. Sellars. That said, I'm a Huge Lara fan. The character was just too cool, and she shared something w/Frank that Catherine didn't. And I think some of the "issues" on the Catherine vs Laura topic boil down to just that. I just view they had a different kind of relationship. I def want to see Lara return in ANY incarnation of a future Millennium project. She was a F'N awesome character. Thanks for the article, it was a good read and you have given ammo for my friends and family to further argue this topic. Thanks for that... I think. First of all I almost spilled my drink whn I read "I hated her". OMG I laughed so much! This is an epic week, we have both sides of the fanbase! Muahahaha so here I go and declare myself "Team Lara" poster-girl. One of the things I was worried about during my video making process, was that I was choosing scenes that might suggest this hidden-silent-maybe/couldbe relationship between Lara and Frank, specially due to the deep deep understanding they both had. And I had a hard time - actually longing for some sort of relationship - when I inserted the last voice over from Frank when he stated aloud that she was the only one who knew. I do support Browncoat´s comment on bringing Lara in ANY Millennium related project since, I do believe there is more to the character and well... since Frank is alone...(<-- insert fangirling here. Needless to say, Mr. Sellars´ article was AMAZING and it is so interesting to see these opposite points of views!! I can’t disagree with anything Sellars wrote. Not because I agree with anything he said, but because there was no point made that inspires my contemplation. He starts off by saying he hated Lara-- not because of what she was, but for what Sellars feared she might become, and what she was never intended to be. It never occurred to me that Lara might become a conflicting love interest or a threat to Catherine, or that she was merely a female version of Frank. Millennium had already established itself as a show that tended to not stoop to such cliché contrivances. I share Adam Chamberlain’s impressions. Then Sellars ends by saying… what? We still have no idea what his opinion of Lara is, or what she meant to him based on who the character actually was as presented on screen. However, the only salient point in the article—-which intrigues me-- is the possibility of Lara existing as a compelling “ghost” figure for Frank to dwell on and rescue. If anything, by dwelling on what Lara turned out to not be, Sellars succeeded in revealing somewhat who she IS. This has been my favorite installment of Lara Means week thus far. It has been very thought provoking. One of the things that has always fascinated me by the series is the examination of the feminine "other half" of Frank Black. In particular, I am fascinated by the failure of Frank to find completion with these other halves. 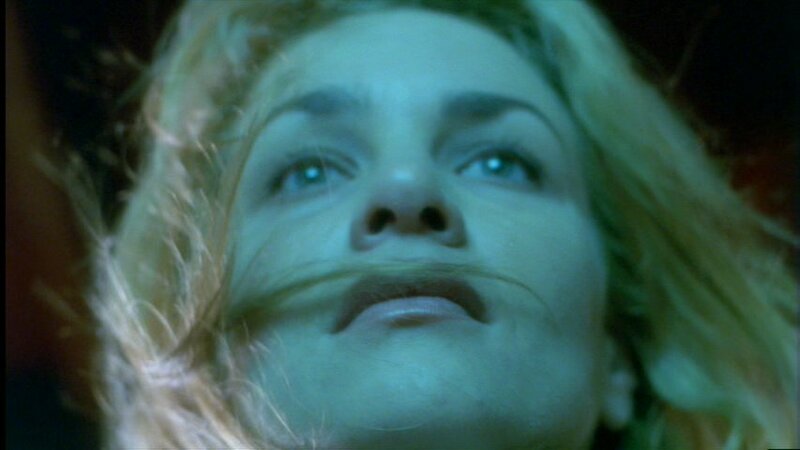 In the first season we examine the traditional other half, and Frank's emotional feminine--Catherine. We learn that a man obsessed compartmentalizes and by doing so isolates his emotions from the rest of his life. There is no room for Catherine any more. The second season introduces Lara and we get to examine Frank's psychological feminine. Sellars brilliantly points out not only how Lara carries the imprint of Catherine but Frank as well. But Frank will not find completion here either. He resents his "gift" (especially since it appears to be more psychically based this season). His resentment of the Group grows as well. Lara embraces these things (albeit seemingly reluctantly at times), and therefore cannot help Frank find completion. She must be abandonded to the Group. The third season introduces Emma Hollis and Frank's intellectual other half. Emma is as much an imprint of Lara and Frank as Lara is of Catherine and Frank. Emma like Lara shares the professinal world of Frank and Lara, but does not have the psychological gifts of Lara. Instead she is like a young Frank Black--eager, dedicated and thoroughly professional. After Frank's devastating loss of his emotional half (the death of Catherine), coupled with the damage to his psychological other (the loss of Lara to the Group), he must focus on the easily understandable and completely rational intellect. However, this too will prove fruitless. Frank cannot function without the emotional, without the psychological. He takes Jordan (a nice mix of Frank's emotional and psychological feminine) and literally runs away. He abandons Emma to the Group as well. What would a fourth season hold? It's hard to tell. I grimace a bit as I say that we know that abandoning the intellectual doesn't work out too well for Frank, as he spends the dawn of the millennium in an institution. I would have loved it if season four could have time jumped so we could have had a slightly older Jordan, and we could examine this new feminine other half a bit more fully. I know I would have liked to have seen an episode focusing on Emma and Lara in season three, much like we had with Catherine and Lara in season two. Think of the emotional resonance if Lara had been the one to ultimately bring Emma into the group. Also fascinating would have been the "season four" episode of Emma and Jordan. In my heart, I know Jordan ultimately represents the perfect feminine other half to Frank. She, particularly after she ages, represent the only chance for the emotional, psychological and intellectual to fuse and help complete her father. I agree with you in most points, except that I never hated her. I did think her introduction in Monster was a bit contrived though, and she was a tad irritating pre Midnight of The Century, with the Here's My Thing line possiblity being over used. ALthough she irritated me a little in Monster and the next episode about the kids and the tornado (I forget the title lol), I did come to love her as she was revealed to be more troubled, confused etc about her gift. I dont remember ever thinking there was any possibility of her and Frank having a sexual relationship though (maybe because I was only 18 and didnt pick up on this as a possibility when it aired). I think I would have hated that if it had happened, Millennium isnt that kind of show - just think....we could have had some variation on Moonlighting except with demons and angels. (shudder lol). I viewed their relationship as a platonic mutually respective one, a little like Mulder and Scully through most of the XFiles run. All in all - i was irritated by her, then came to love her, but never hated her. I also loved Catherine Black, and any moment she was in season 2 was a highlight for me. I just wish she and Lara had more screen time together, perhaps a scene in the finale. That would have been amazing. This is, as I hoped, a very inspired conversation (and maturely handled thank the lords!). The interview we have for you on Sunday (/plug) with Kristen actually covers a little of this ground - and I hope will enrich debate as to the questions that have been raised here. For my part, as I think I say in the interview, I wasn't initially comfortable with the character, but I think any insecurities I had about this new character being added to Frank's world were lost when you see the direction she's taken. Her story is even darker than Frank's - and I think for me, that's what makes Lara such a special addition to Millennium. I never hated Lara Means but I like the article because it provokes discussion and that’s always good. Being a write too I also tend to be very critical, and I also thought about the possibility of a romantic relationship between Frank and Lara but it would have never worked--maybe as a fling and a snap-back to reality. Lara was too unstable to give herself to anyone no less a man who already had a nervous breakdown. In my humble opinion they would have hurt each other more than helped. As Assistant Director Andy McClaren said in season three’s “The Innocents”, Catherine kept Frank sane and I totally agree, and when for whatever reason they decided to kill the Catherine Black character, the show was never the same. Other than the yellow house, which represented purity and hope, Catherine in the beginning brought light and balance to Frank’s dark life. I would have liked to see Frank and Lara work together to help bring down the Millennium group. They both new the true evil of the group, and if there is a movie and I am hoping for one, I hope that Lara Means is brought back, and I’d also like to see how Jordan’s gift evolves under Frank’s tutelage. My vision for the end of Millennium was to see Frank become the old man in the woods. John brings up a fascinating point that I've wondered about: people coming into Frank's life to help compensate & stabilize Frank in aspects he lacked. Not just the feminine of Lara, Catherine, Jordan & Emma-- but every person imporatant in Frank's life... like Bletch, Peter, even the Old Man. it seemed like when one aspect/ person was absent in Frank's life, another would enter to keep the balance. I think Lara percieved this vulnerability in Frank, which is why she advised Catherine to never leave Frank alone. Also, I would have liked to see more interaction among the females: Lara and Jordan, Lara and Emma, Lara and Catherine. Indeed, I realize that there is still much story potential around Lara.